I’m quite an avid shortcut user. Linux/KDE is an environment where this type of user feels right at home. Not only do most actions in a software have a shortcut, you can also define lots of system-wide or global shortcuts. Kwin, KDE’s window manager defines quite a few out of the box. This is all fine and dandy until you want to use this cross-platform software which you got used to in a different environment (i.e. windows at work) and you want to start using it at home. When the application is not (KDE) shortcut friendly or you are so used to the windows keymap that it’s a pain to learn a new scheme, you start to feel frustrated. Learning a new shortcut scheme seems the best solution but this doesn’t work well when you have to maintain 2 shortcut schemes in your head, depending on your environment (home vs work, your computer at work versus a colleague’s computer). A typical example here would be some IDE, for example Intellij IDEA. Although the IDE does provide a KDE keymap by now, I started using it ages ago when there simply was no alternative keymap (nor a community edition or even official linux version, I guess). Also, I used linux only occasionally back then. These shortcuts are hard-wired by now and it is already hard enough to keep in mind whether I’m using Intellij or Visual Studio. 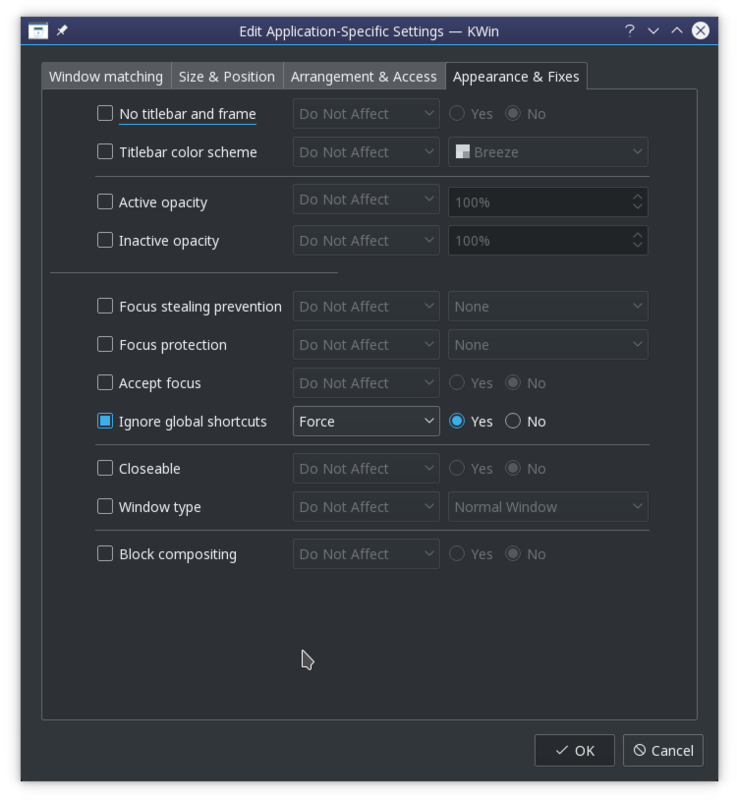 KDE, being the configurable desktop environment, does offer some configuration settings. For each window, Kwin allows you to define rules which match certain windows / applications which creates a config. Using this config, you can configure special window attributes. One setting is to block all global shortcuts. Since I just wanted a quick fix (I thought, let’s check this out for 30 mins, which turned out to be a lot longer of course), I chose to patch the behavior of the “Ignore global shortcuts” setting to exclude the Alt+Tab shortcut (more precisely, the shortcut currently assigned to the “Walk through windows” action). I briefly investigated KWin’s scripting abilities but it turns out the required functionality is not exposed. I thought it had to be kwin, right? So I checked out the source from github and started searching for “Ignore global shortcuts”. It turned out to just call something in kglobalaccel which is not part of kwin. Browsing the source, I finally find a possible tweaking point in the src/runtime/component.cpp -> deactivateShortcuts method. 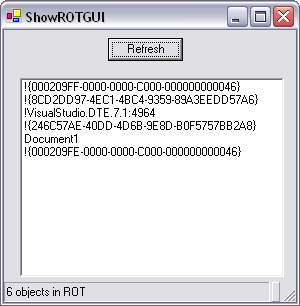 It disables all shortcuts when a window is entered which has a “Ignore global shortcuts” rule. So I simply added an exclusion for the “switch windows” action. Time to try it out! In order to build it, you will need to install its dependencies. On an rpm based system, the easiest way to go forward is to do a “sourceinstall” of the rpm in case. For that, we first have to know which rpm contains the affected shared object (.so file). An alternative way would be to find a kde related rpm matching “global” and then checking its contents (using “rpm -q –filesbypkg <rpm>”) for the .so file. I had played with logging before in KDE, but of course things have changed with KDE 5. Nowadays, KDE uses Qt’s default logging mechanism. It meant figuring out the logging category used by kglobalaccel and finding a way to activate it. The logging category was nicely tucked away in logging_p.h: “kglobalaccel-runtime”. Activating it seemed to be trickier. According to the Qt documentation, you can alter the log level through an env var QT_LOGGING_RULES. Since I was adapting a core component, I needed to set the env var before logging in. On opensuse you can create a file /etc/profile.local which gets sourced by /etc/profile. I added the env var and it seemed to work (=showed up), unfortunately still no logging. More precisely, nothing showed up in ~/.xsession-errors-:0. I started adding log statements all over the place, analysing the .so file to check whether my modified method was actually included in it (readelf -Ws libKF5GlobalAccelPrivate.so.5.32.0 | grep deactivate), etc.. Until I realised I didn’t check the journal (journalctl -b -0) yet, there it was. 🙂 Bonus points: the code change had its intended effect! Okay, so I finally got to it. A few months ago I bought a wiimote to play a bit with the api’s floating on the net. It was until yesterday that I actually tried a driver, and since that seemed to work okay, I decided to give it a try myself. My simple goal, being an app plotting the raw inputs. However, it took me a 2 hours more than expected (1 =)) and also a lot more blood, sweat and tears. 😉 particularly because I made a lot of mistakes due to me being too tired 😉 So I will keep it short for now as I want to go to sleep. I choose the wiiuse library as it seemed adequate for the job and still active (and even cross platform!). I started from the included example and tried to wrap it into a Qt app (hence I named it example-qt ;)). The obvious choice for drawing is using QGraphicsView. 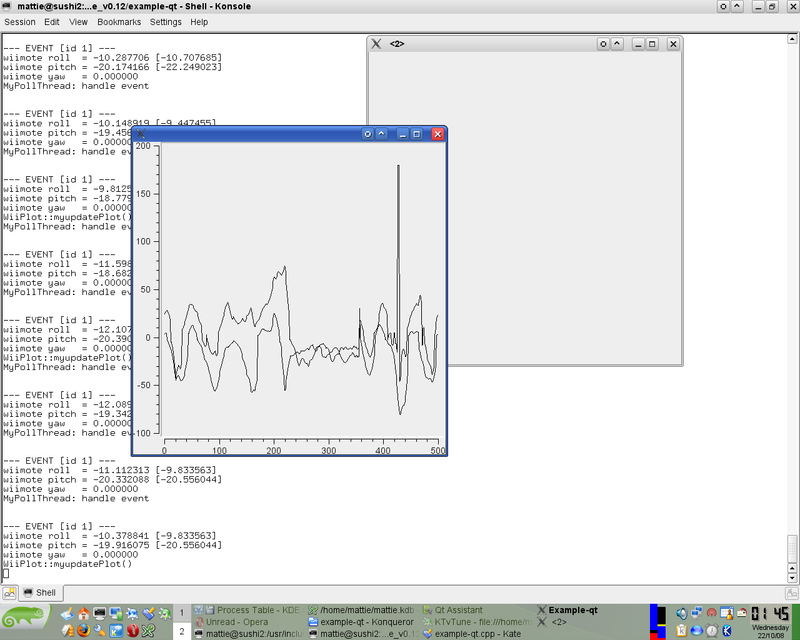 However, for once ;), I took the effort to see if there are no existing Qt graph plotting libraries. And this just happens to be the case. 🙂 Meet the excellent QWT lib. It couldn’t be more fit for the job. The site is (almost) nothing but the api docs, but that seemed sufficient. One second I thought this lib would not be qt4 ready, but it has been ported! Some while ago, I start coding a feed reader in J2ME to run on mobile phones. After some searching, it seemed like Netbeans would be the way to go.. They provide a nice UI builder including modeling of the flow between the different screens, tailored towards cell phones. Also, it seems the Sony Ericsson SDK provides nice integration with Netbeans. My favorite java IDE IntelliJ doesn’t seem to support mobile development at all. (for the record, I wouldn’t use IntelliJ if I had to pay for it myself ;)) The next best thing, Eclipse, seems to be less mature in this area, although they are progressing fast. So Netbeans it became. Well, I set up netbeans and created a project and all, so I could get to serious work on my 2h train trip. Unfortunately, I didn’t manage to write a single line of code! 🙂 As soon as I opened my laptop, the Netbeans IDE seemed to have become very unresponsive! Opening a menu could take 10 seconds, scrolling through the code is impossible. I couldn’t believe my eyes at first, so I rebooted because I thought my laptop was having trouble waking up after having the short nap. However, not improved. I had to give up.